Last week a friend gave us a 5 pound bag of frozen blueberries. I was tempted to let them sit until winter since we are so enjoying lots of fresh blueberries right now. But with only an above-the-fridge freezer that I like to keep full with meals, I realized that probably wasn’t the most prudent idea. So I decided to make a blueberry pie today and to use some of those frozen blueberries. I just winged it as I went. I was also listening to my kids play with my father-in-law and a new toy he brought for them. So, I wasn’t fully focused. You’ll see what I mean. 1. In a large bowl, combine flour and salt. Cut in butter until crumbly. Stir in cold water just until dough starts to form a ball. Pat into a ball with hands and roll out. Press into a 9 inch pie plate. 2. Wipe out the bowl and add blueberries. Toss with sugar. In a small cup, dissolve cornstarch in water. Stir into the berries. Pile in pie crust. 3. In a small bowl, combine oats, brown sugar and flour. Cut in butter until crumbly. Sprinkle over blueberries. 4. Bake at 350 degrees for 45 – 60 minutes. Cover top and crust edge with foil if it gets to brown. Let cool at least one hour before cutting. And here is what happens when you forget to add the cornstarch. Oops! I stared at the pie as it cooled just hoping it would miraculously firm up. No such luck though.So we are enjoying some delicious blueberry soup pie instead. I betcha some vanilla ice cream would be great with the soup! :)looks yummy anyway. we love blueberries here. Sounds good – I have lots of blueberries I need to use so we can try this out! This dessert still looks absolutely delicious. Even without the cornstarch. I have never cooked anything with fresh blueberries, so I am looking forward to preparing this. Sound delish! I like that you can use frozen blueberries, as the fresh ones tend to be pricey in my area. 🙂 Visiting from Jen’s party! Oh Yum! Definately adding this to my list! Wow, 5 pounds of blueberries, that’s an awesome gift. Yummy! What an awesome gift! We have all forgotten an ingredient once, or in my case, many times! It still looks yummy. I think that “soup” would be good warmed up over ice cream! Thanks for sharing. Good! I mean, good in that now I know I’m not the only one who has done something of the sort. 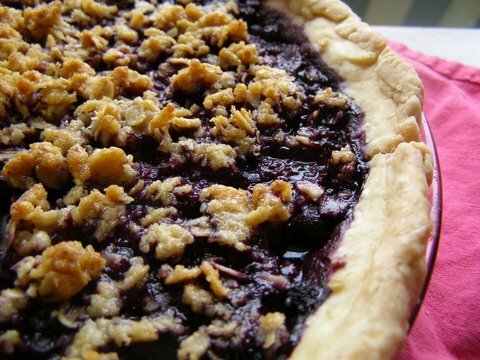 I love blueberries and I know missing that binder indgrediant makes for a major “dissapointment” – especially when taking the pie to a gathering or when guests are over. I also often wondered how you do come up with so many creative recipes all while little ones are around (in and out of the kitchen)- HOW do you even find the stolen moments…? I’m having trouble figuring it out for myself and I only have two little ones. You are so funny. This lets us all know that you are human, too!! 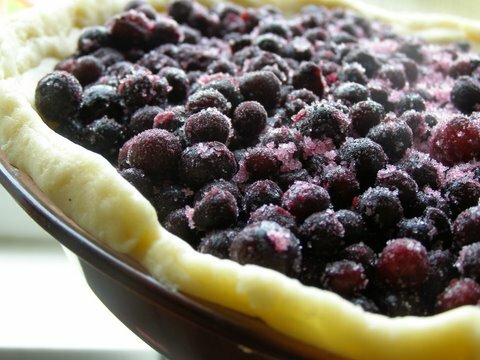 The pie looks great, even without the corn starch.Thanks for linking up to Tempt My Tummy Tuesday. Oh, I am so loving this. Blueberries are one of my absolute favorites. Thanks for sharing. 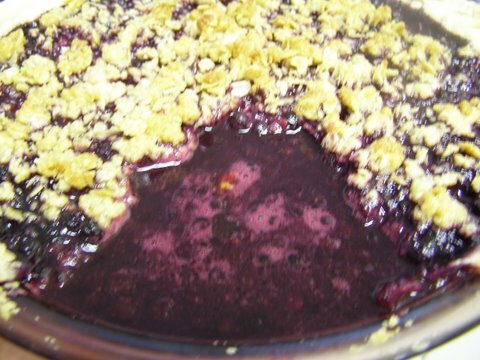 I LOVE this idea… crumble and pie!